Binaural audio: What is it? How can you get it? | What Hi-Fi? Having a perfectly immersive sound is the audiophile's dream, but can binaural audio do that? And how is it different from surround sound? We have the answers. To some extent, you already have access to binaural audio. It’s simply a fancy way of describing how human beings normally hear sounds - 'bi' meaning two, and 'aural' referring to your ears. Soundwaves hit each ear at different times, and at different volumes, and with that information your brain can calculate the origin of the noise. That’s how you can tell, if you were to close your eyes, how close or far away a particular sound might be. But while that might be how you hear normally, it’s not how you listen to music. When you put on your headphones the sound places the soundstage squarely in the middle of your head. Binaural recordings, however, are optimised for headphones and can recreate the perception of distance - making your audio more immersive. How is a binaural sound mix made? Binaural recordings aren’t a new technology by any stretch of the imagination. They were first demonstrated in France in 1881 through a device called the Théâtrophone, which looked like two old horn-style telephones that you held against each ear - it played concerts or plays recorded through a series of telephone transmitters connected to the stage. Fast forward almost a century, to the 1970s, and technology had developed to provide more accurate recordings. 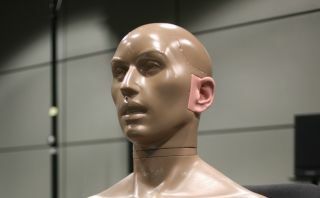 ‘Dummy heads’ - which looked like mannequins with microphones placed in each of the ear cavities - were used because they could account for extra variables such as vibrations within the ear canal, or the reflection of sound off the shoulders, that external microphones wouldn't be able to pick up. Of course, these were still flawed - the material used, while more similar to the texture and density of human skin, still wasn’t absolutely identical, and the heads themselves were inconvenient to transport. This wasn’t so much of an issue for radio recordings, as the dummy could stay stationary as it recorded the sound, but for a television programme (with its multiple cuts and locations) this was simply too inconvenient. Today, sound engineers have a computerised substitute for the dummy head, in the form of binaural algorithms and sophisticated sound-editing software such as Newendo. By using mono recordings of dialogue or sound effects, they can manually adjust the volume and timing to simulate the way you would naturally hear. Play that through a pair of headphones, and your brain is easily fooled into thinking that an artificially made sound effect is coming from anywhere around you, above you, or below you. What do I need to listen to it? The beauty of binaural audio is that you don’t need any fancy equipment to experience it. Even a standard pair of Apple EarPods (or AirPods) will be able to recreate the effect, although we would recommend using something a little more accomplished so that you can experience ‘natural’ sound with as much detail as possible. But many sound engineers are very conscious that not everyone who might listen to a binaural mix is a What Hi-Fi? reader and, as such, might not have kit that can reach down so far into the bass, or high enough into the treble. As such, sound mixers using £1000 headphones need to make adjustments to ensure people using £10 headphones don't lose out (as they would also do on a standard stereo mix). LFE (Low Frequency Effects), for example, are moved a little higher into the frequency range to ensure they’re noticeable, and the dynamic range is compressed a little more, so that people using smartphones don't need to have the volume turned up to potentially damaging degrees. Ultimately, the more people using better headphones, the better quality we'll get from binaural sound - so start persuading your non-audiophile friends (if you have any!) to upgrade their kit. Where can I hear binaural audio? While the potential for binaural audio is available to anyone with a working pair of headphones, its implementation is less widespread. The fourth episode of Doctor Who’s most recent series, entitled Knock, Knock was given a binaural mix you can find on the BBC iPlayer - where alien beetles scuttle in the woodwork and the creaks of the house come from all around you. Similar tools were used to produce spatial sound for several of the 360-degree Planet Earth II videos that can be found on YouTube. And if you’ve got a Google Daydream VR headset, the Turning Forest experience also has binaural audio. There are also thousands of binaural ASMR (Autonomous Sensory Meridian Response) videos on YouTube, claiming to trigger a static-like or tingling sensation on the back of the neck or the down the spine that are supposed to have soothing and calming properties. Over the years, musicians such as Lou Reed, Thom Yorke, Beck and Imogen Heap have experimented with binaural audio, producing virtual-reality concerts or binaural albums (such as Pearl Jam’s imaginatively named Binaural). For television, you’re much more likely to get binaural mixes for dramas, or programmes with an international market, than you are in any other genre. Having dialogue over a sound effect makes it much more difficult to mix binaurally, but drama programmes often have their audio effects recorded separately so other countries can place dialogue in their native languages over the top. This means a sound engineer has a cleaner sound to manage, and so can work faster. In an ideal world, you would have one single sound format that can be decoded into stereo, 5.1 surround and binaural depending on your output - cutting down the time it takes to add a binaural mix from a week to a day. While the technology is under development, its complexities mean we’re not likely to see it anytime soon. What's the future of binaural audio? The obvious place for binaural audio is in virtual reality, a medium that’s becoming more popular as the variety of headsets available from tech companies expands. The Samsung Galaxy Gear, Google Daydream, Oculus Rift, PS VR, and HTC Vive have all introduced a wave of VR content, and are sure to continue to grow. And, of course, if you move your head closer to a sound in a VR space, you expect that sound to get louder - if it doesn’t, you’ll lose that all-important immersion that really sells a virtual-reality experience. Whether VR becomes more acceptable to the average user is a different story. While VR is becoming more common, the number of people that use it and would benefit from binaural audio is not that great. The point of entry usually requires either an interest in gaming or a powerful PC set-up and, although Netflix (pictured above), Sky, and Google have taken steps into making it easily accessible, there’s a long way still to go. Nevertheless, whether it comes through a virtual world, streaming service or good old-fashioned vinyl, the development of more binaural products is still something to watch (or, perhaps, listen) out for.